I met with wife/husband duo Bonni Cohen and Jon Shenk (Audrie & Daisy) on Thursday, July 20, 2017, just a little over a week before their new documentary, An Inconvenient Sequel (which I also reviewed), had its first, limited release (the wide release is scheduled for August 4). I saw the film at AFI DOCS 2017, where it received an extremely positive reception. It’s a follow-up to Davis Guggenheim’s 2006 An Inconvenient Truth, and like that film, it focuses on the efforts of former Vice President (and almost President) Al Gore to promote effective climate-change policy across the globe. Given the recent election of Donald Trump and his attempts to walk back U.S. leadership on this issue, it’s an extremely timely movie. I had previously interviewed Bonni, though only by phone, for Audrie & Daisy. This was my first time meeting both in person. Here is a condensed digest of our conversation, edited for clarity. Hammer to Nail: So, Davis Guggenheim directed the first film. How did you two end up directing the follow-up? Bonni Cohen: So, Participant Media – Jeff Skoll’s company, based out of Los Angeles – were the producers, and they were the producers of An Inconvenient Truth, and they have a tremendous slate of both fiction and nonfiction films that deal with the social issues of our time. An Inconvenient Truth is, perhaps, the most successful documentary that they’ve ever done, and that’s now coming up on 11 years ago. Jeff Skoll and Diane Weyermann – who runs his documentary unit – and Davis Guggenheim have been talking for years about whether or not a sequel to that film was something that they wanted to step forward and do, and they decided on a “10 years later” idea for the sequel. Of course, Davis could have done it, but he was busy, so he couldn’t do it, but they enlisted the whole first team to come on board as executive producers and then find a directing team to make the sequel. Diane Weyermann is a dear old friend of ours – we’ve worked with her many times in the past – and I think she thought of us for a number of reasons, including that we had made another climate film that she was a big fan of. And in July, 2015, we got a call to come on board the sequel. Why now, 10 years later? Well, the predictions that Al Gore made in An Inconvenient Truth had not only come true, but the reality was actually far worse than the predictions, in some cases. The climate crisis has escalated; weather patterns are changing; hottest years on record, year after year; sea levels are rising; so all of that needed to be updated. I think, though, equally as important to them, and now to us, was that 10 years ago, the ideas for solutions to the climate crisis were being discussed and they were starting to become reality, but now…they’re here. The cost down-curve of solar and wind is undeniable. If you just look around this country, towns and cities are starting to take up alternative energy; it’s an economic reality now that makes sense. So, in terms of the sequel, not only were we going to be able to present the update to the climate crisis, which was incredibly important, but we had a very hopeful piece to the film now, which was these solutions. HtN: So, the last film of yours that I saw was Audrie & Daisy, which was released just last year. How much overlap in the two productions was there, if at all? Jon Shenk: (laughs) You’re bringing back flashbacks. BC:…getting a Ph.D. in the subject! JS: (laughs) Exactly! We almost feel like we get degrees in the subject that we make films about. But thankfully, with climate change, we were already at least halfway there, at the beginning of the film. Al Gore in Greenland as seen in An Inconvenient Sequel: Truth To Power from Paramount Pictures and Participant Media. HtN: You do both have advanced degrees, in film, though, right? Didn’t you both go to the Stanford documentary film program? BC: We did! That’s where we met. That’s where it all began. HtN: Yes, I remember! You told me in our previous interview. HtN: So you’ve already mentioned this fact, but this is indeed not your first film about climate change. In 2012 you released The Island President, about the plight of the Maldives. How much more dire is the situation in the Maldives now than it was then? Have you kept up with them? BC: Politically, or in terms of the climate crisis? HtN: I’m more interested in their climate crisis, which would, of course, affect the political situation. JS: Well, I haven’t been back to the Maldives since 2009. But I’ve heard that it’s getting worse. You know, the weather patterns that we’re all feeling around the world – the kind of shifting weather patterns, the unpredictability, the change in the seasonal rains – have all affected the Maldives. So have the sea-level rise and the groundwater penetration from seawater, which have continued to be a problem there. And unfortunately, the new dictator of the Maldives, who ousted [President] Mohamed Nasheed, cares nothing about the climate. What’s going on there is just this corrupt selling-off of islands to corporations and then the embezzlement of those funds into the personal bank accounts of the dictator and his family. So, it’s a basic human-rights and environmental nightmare. The interesting thing about the story of Nasheed is that, for Bonni and me, he was kind of a key character in our lives, because he taught us that human rights and environmental activism – environmental rights – are one and the same. As we degrade our environment, the first people who get affected are people who have fewer resources. Poor people are those who suffer the most, and Nasheed was that voice, especially while he was in office. HtN: Speaking of political madness, your film features at least one Republican politician willing to work with Al Gore. But, in general, the GOP has become, with each successive year, ever more an anti-science, obstructionist entity. What hope do you see, perhaps, in reversing that trend? BC: Well, when we went to Georgetown, Texas, which is a hotbed of conservative Republican political thinking, and had that experience with that mayor who totally got that the wind and sun energy resources in Texas could be used to bolster the economy, not only in his town, but he could see it happening in other cities around…I mean, it was not a small town! 65,000 people in Georgetown…that did give us a tremendous amount of hope for reaching the GOP, in terms of economics, and how much sense it makes, economically, to turn to alternative energy. We also know, from having met a lot of people in the making of this film, who have met with Al about this very issue, that there are a lot of Republican senators and representatives who are just on the cusp of turning over on this issue. They’re just looking for the right opportunity. So, to us, it does look as though there’s going to be a groundswell of change. The American people are not stupid when it comes to economic viability, and also the realities of what’s going on with the climate crisis. The farmers in the middle of this country are experiencing insane weather patterns: they can’t do what they used to be able to do with their farms; they’re not as productive. Fishermen are having the same issues out on the ocean, or similar issues due to the warming of the oceans, etc. So, there are ways in which the climate crisis is starting to creep into mainstream American life and culture that the legislators are not going to be able to deny anymore. HtN: Well, here’s hoping. As Al Gore says in the first film, if you just make it about money, you end up ignoring the larger issues. If we have no planet, who cares about economics? 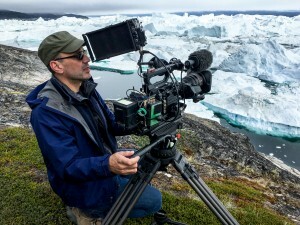 Director and Cinematographer Jon Shenk on the set of An Inconvenient Sequel: Truth To Power from Paramount Pictures and Participant Media. HtN: Speaking of Al Gore, a man I admire, he’s clearly been very successful internationally, in pushing these issues. He has been less successful in the U.S., because of ideology and the way our political system works, and he, himself, sort of muses about that in your film, wondering what it says about his own personal failure. Is it time for a new face, at least in the United States and if so, have you encountered such a person? BC: In terms of climate leaders? HtN: In terms of climate leaders, who could maybe take it to the next level and reach across the partisan divide. JS: I think Al’s answer to that, in our experience, would be “the more the merrier!” The amazing thing that we’ve witnessed, in making this film, as we’ve traveled with Al around the world, is meeting people who saw An Inconvenient Truth and said it changed their lives and their careers, and started up alternative-energy companies. Christiana Figueres saw the film, went to the training with Climate Reality, and then became the leader in Paris to help broker the international deal. There are other faces of the movement out there; Al’s just one. And now, increasingly, there are people across the political divide, because this was never really meant to be a political issue, in the first place. The fossil-fuel companies have muddied the waters and they’ve made it seem like there’s a controversy about the science, but there really isn’t. Grown-up people, smart people, when discussing this issue, know that there needs to be a change in the way that we get our electricity and in the way that we power our transportation. And there are smart people around the world who, like [California Governor] Jerry Brown, like [New York Governor] Andrew Cuomo, like [former New York Mayor] Michael Bloomberg – an independent – and Republican mayors in Texas and all around the country. BC: The guy in Orange County who switched over. JS: Darrel Issa, one of our most conservative congresspeople, from California – the state where we live – switched his position on climate change. What happened was, the Republicans have figured out a way to gain power, in our state houses and in our federal government, but I think one thing they didn’t anticipate was that once they were in power, they were going to have to actually represent the views of Americans. And the views of Americans are, in all 50 states, that people have caused climate change and we need to do something about it, and that it’s actually economically more viable to move towards sustainable energy than it is to stick with the old way. BC: The other thing to note is, as Jon was saying, that there were so many people affected by the first film, and for young people in this country, this is their issue: this is their existential crisis. You know, when we were growing up, it was the nuclear bomb. For them, it’s the environment, and they take these kinds of films very seriously, they’re interested in movement-building, and I think we’re going to see a proliferation of…I feel like every other college student I talk to is majoring in environmental studies. So, we have a lot of hope for who we’re raising in this country to take up the charge, and I think Al Gore feels that way. It’s one of the main reasons he does the training sessions. HtN: Well, I hope you’re right! In any case, congratulations on the film!